Monday 17th August, at 7:30 in the morning Israeli bulldozers started overturning the earth and uprooting olive trees from the lands which are situated in the valley (Wadi Ahmed) at the feet of Beit Jala north west of Bethlehem. The Israeli Occupation forces had started preparing their “working site” during the night, without prior warning to the owners of the land, closing and militarizing the area and parking the bulldozers on the land between the olive trees. The targeted land and trees are owned by the families of Ash-Shatla, Abu Eid, Khaliliyah, Zeidan, Mutalaq, Abu Sa’id, and Abu Ghatas. Since Monday morning, daily protests have taken place with the participation of the locals to denounce and prevent the construction of another piece of the Apartheid Wall, which will cut off Beit Jala from 3000 dunums of its land, the majority of which has plantations of centuries-old olive trees. 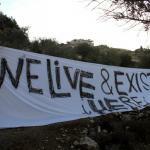 On the 19th August, a popular protest against the building of the Apartheid Wall on the land of Beit Jala, took place. The demonstration was planned to include a Christian mass prayer on the confiscated land between the olive trees. Many olive plants were brought on site to be planted in place of the uprooted ancient olive trees. The protesters were blocked at the entry of the site by a military jeep and an exaggerated deployment of Israeli military and police forces. Unable to reach their lands, the protesters demonstrated with chants against the racist Israeli practices and land grab. The protest was eventually broken up by the violent attacks by Israeli military and border police in order to disperse the demonstrators. As a result the Israeli forces arrested two of the activists members of the popular resistance: Munther Ameer and Ahmed Odeh. The priest displayed an altar in front of the military block and gave communion despite the situation. The lands that are being confiscated are an important source of income for the local population: a large number of Palestinian farmers from Beit Jala live off these trees, among others, by producing high quality olive oil. Not only will the construction of the wall separate these lands from the inhabitants, but it will also create a new wave of displacement and deprive them of economic income as a result. The Israeli plan is to control most of the lands of Beit Jala, Battir, Khader and Hussan in this area for the continued expansion of the settlements of Gilo and Har Gilo for the purpose of connecting all the settlements in the Bethlehem district with Jerusalem. The confiscation of Wadi Ahmed (3000 dunums), Wadi Al-Makhrur (3500 dunums) and the lands on which the three illegal settlements of Gilo, Har Gilo and Givat Hamatus (2000 dunums) are built, have reduced the land of Beit Jala to half its original size. The built up area of Beit Jala counts only 4000 dunums, and it is being endlessly cut off from its natural resources, giving no possibility of expansion for the future Palestinian generations. It is necessary to stop this plan as it solidifies the process of segregation within the Palestinian territories in the West Bank. This plan is one step further in the Israeli territorial plans to create South Africa-style Bantustans. Specifically in the district of Bethlehem the lands designated through the Oslo Agreements as areas A and B under the control of the Palestinian Authority, constitute only 12% of the district. What is left of the district is categorized as area C, and remains under direct Israeli control. Directly after the 1967 war and the start of the occupation, there was a clear Israeli policy of building settlements on the lands of Bethlehem, because of its proximity to Jerusalem. This allowed the occupation to control a large part of the land and annex it to Jerusalem. The process of land confiscation continues to date and the current military operation in the area of Beit Jala is but the latest installment. The first Israeli settlement in the West Bank, Kfar Etzion, was established in the Bethlehem district. Since then the Israeli government has established 22 settlements and 24 settlement outposts in the Bethlehem district alone. The population of these settlements now equals that of the native population of Palestinians in the district. The settlements directly control 40% of the land and indirectly control 67% of the total region. The Apartheid Wall in the area will span 83km when completed, spiraling deep within the Palestinian cities and villages, dividing the district into 13 bantustans, and transforming the lives of Palestinians into a living hell within open air prisons. The Apartheid Wall, contrary to Israeli claim as a security measure, is a primary colonial instrument in the ethnic cleansing and forced displacement of the inhabitants from their land.